A photographer’s view of Texas under the stars. A rough Texas landscape tucked under a blanket of stars and bathed in moonlight — there’s nothing more awe-inspiring. 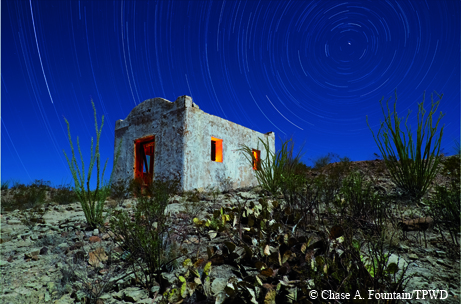 Intrigued by the challenges of night photography and motivated by a love for the stars, Texas Parks & Wildlife photographer Chase A. Fountain set out on a quest to photograph Texas in a different light – by moonlight and starlight. Texas is big sky country, and there is no better furlough than to get out of the big city, head to empty spaces and spend an evening marveling at the stars. Join us on a journey through Texas at night, with photographs taken throughout the state and at Texas state parks. 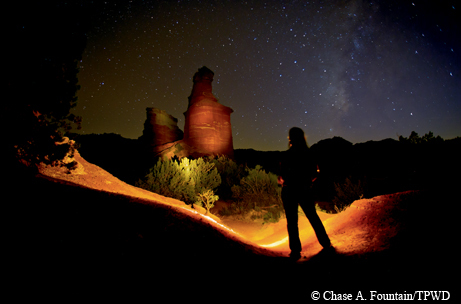 ﻿State park employee Sabrina Cortez illuminates the landmark Lighthouse formation with a flashlight at Palo Duro Canyon State Park. Illuminated by the full moon and a modified flashlight, this six-minute exposure looks warm and inviting despite the rugged surroundings. The adobe structure, nestled along the Rio Grande, is not as old as it looks. The cottage was built in 1985 as part of the Contrabando movie set at Big Bend Ranch State Park. 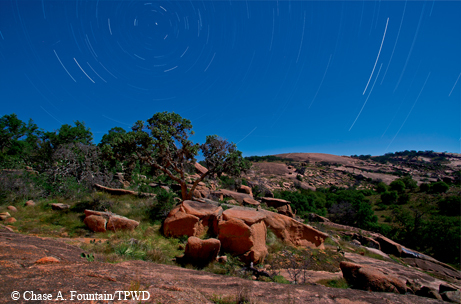 This one-hour nighttime exposure at Enchanted Rock State Natural Area, facing north, illustrates the Earth’s rotation. 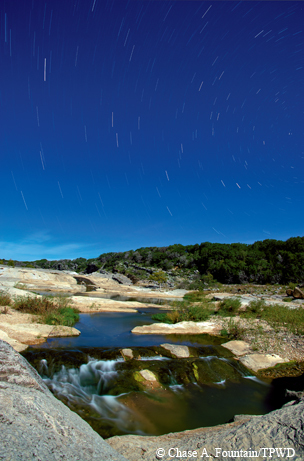 With the full moon at the photographer’s back, Pedernales Falls at night is revealed in detail. Four five-minute exposures were stacked together into one image to highlight the star trails. 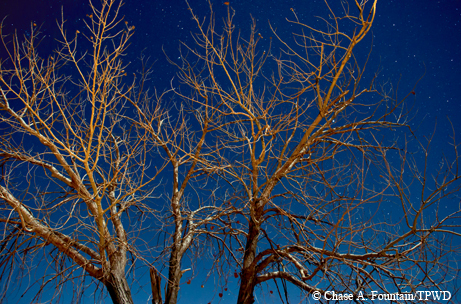 Stars shimmer through barren trees at Caprock Canyons State Park. Looking out from the abandoned mercury mineshaft of Villa De La Mina in Terlingua. 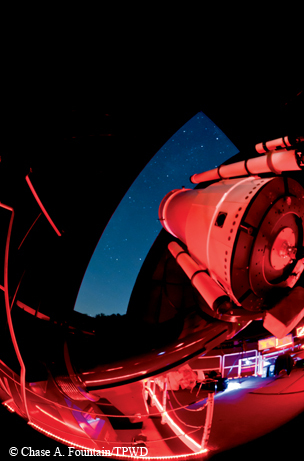 The 36-inch Gueymard Research Telescope, one of the largest telescopes in the U.S. regularly available for public viewing, points toward the heavens at the George Observatory at Brazos Bend State Park near Houston. 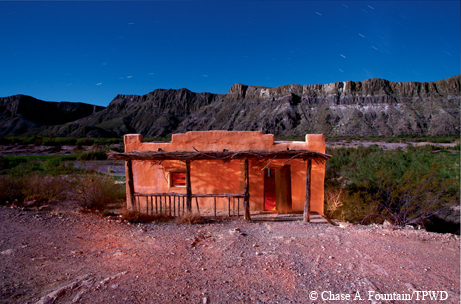 Taken at the Contra­bando movie set on the banks of the Rio Grande at Big Bend Ranch State Park, this image (the photographer’s favorite) merges 27 five-minute exposures. 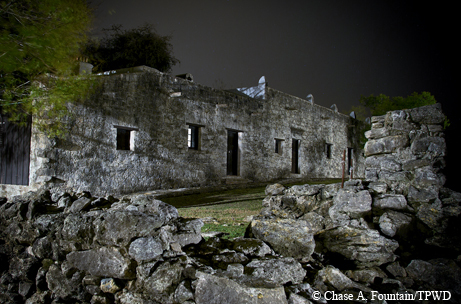 On a cold and cloudy night, the grounds of the Mission Espíritu Santo State Historic Site in Goliad State Park took on a ghostly look. 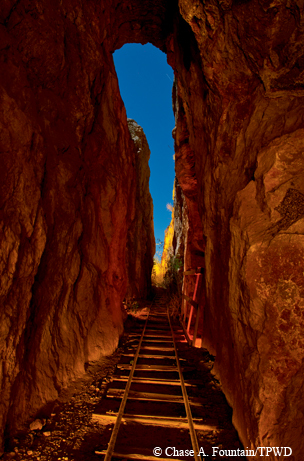 Details were enhanced by using a flashlight in this six-minute exposure. Looking as if it were taken on another planet, this six-minute exposure was captured just outside Study Butte. 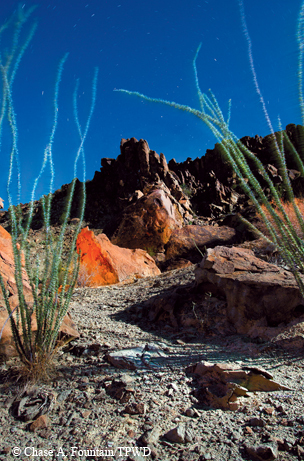 The ocotillo plants in the foreground were accented by an LED flashlight, while the rock in the background was exposed with a single flash with an amber filter, giving it an unworldly look.